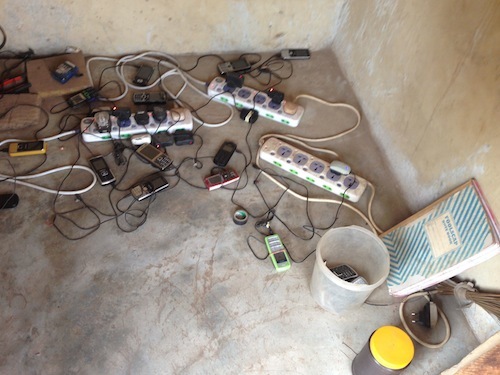 Since the solar center opened in Wambong , Salima and Abiba, the solar center entrepreneurs, have charged more than 1,000 cell phones, earning more than 200 GHC (about $100) in profit. Abiba, known by friends and family as “Chang Chang”, reports cell phone sales are high. When people run out of cell phone battery, they immediately come back to charge. Even people from neighboring communities travel to Wambong to charge their cell phones. At 20 pesawas (about $.10), it’s a bargain deal! The only community in the area with electricity is Sankpala, a much larger community, about 6 miles from Wambong located on the main road to Kumasi. They charge 50 pesawas (about $.25) per cell phone charge. Wambong community members line up to charge their phones! CWS Project Manager, Peter, stands next to the solar panels — 270 watts/hour in direct sunlight! Yesterday morning, CWS Project Manager, Peter and I monitored Wambong. 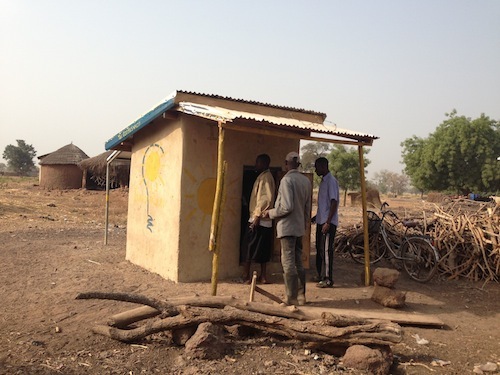 We drove up to the solar center only to see customers pouring out of the InnovaSun door with Abiba seated, taking payments and rearranging cell phones. She was almost too busy to meet with us! Customers kept coming. After a half hour, sales slowed and she had time to chat. She told us that people always come with their cell phones but lantern sales have been low. Only 2 people had come to charge their lanterns in the last 10 days. The quality of the lanterns that were distributed is not great, the battery lasts anywhere from 30 minutes to 3 hours. 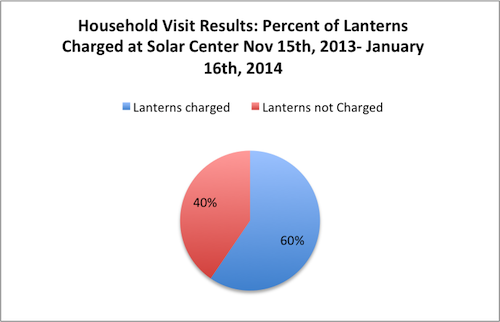 So families do not think it is worth the 10 pesawas (about $.05) and 12-hour charge time to get only 30 minutes of light. CWS is in the process of researching better quality lantern options for future pilots. 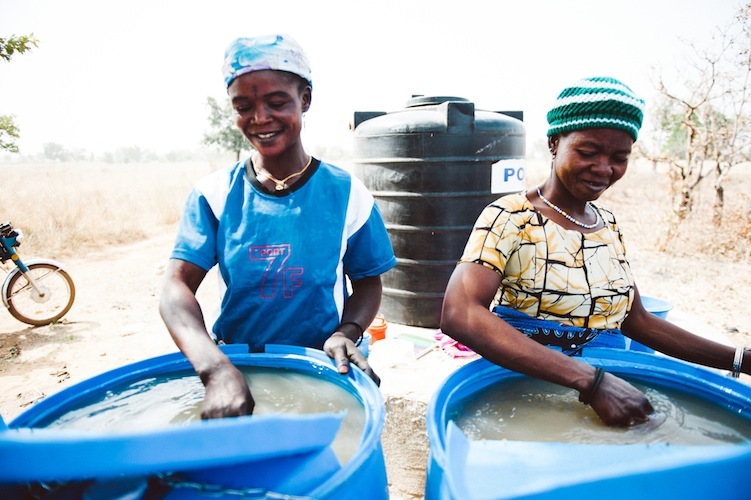 Abiba and Salima have also been talking to the CWS field staff about opening a bank account with the money they have saved so far. They will be the first CWS entrepreneurs to do so! While the center has been running smoothly, there has been some backlash from men in the community who are interested in getting a cut of the pie for themselves. In Wambong, the men are the family breadwinners, so the fact that these female entrepreneurs have been raking in the profits, seems threatening to some. CWS field staff offset initial interest from the men by informing them that the solar panels are expensive and if anything breaks, the women need to have money set aside to fix them. In the near future, CWS hopes to work with men and women who are interested in using the solar center to start businesses of their own, which will take some of this negative attention away from the entrepreneurs. 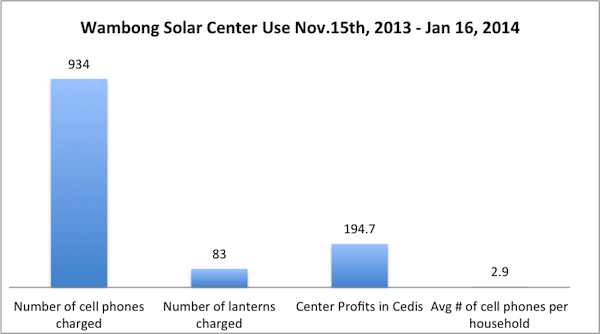 Solar center use since November 15, 2013 — numbers should be even higher if looking at solar center use since opening night on October 31, 2013. Monitoring did not start until November 15, which is why there was a delay in data recorded. 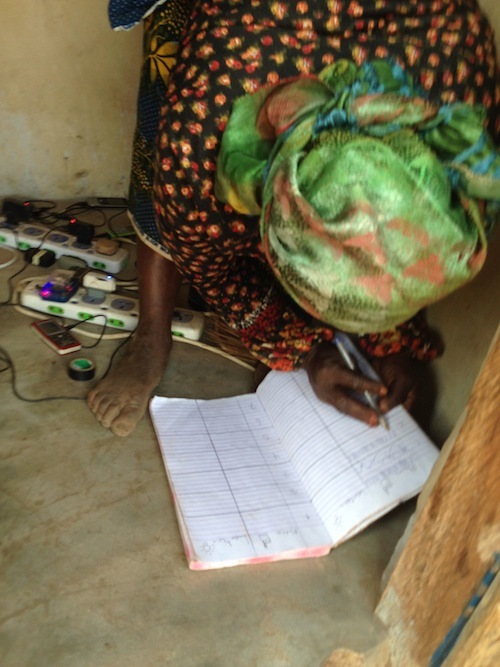 Abiba records phones in her sales book as people come to charge! 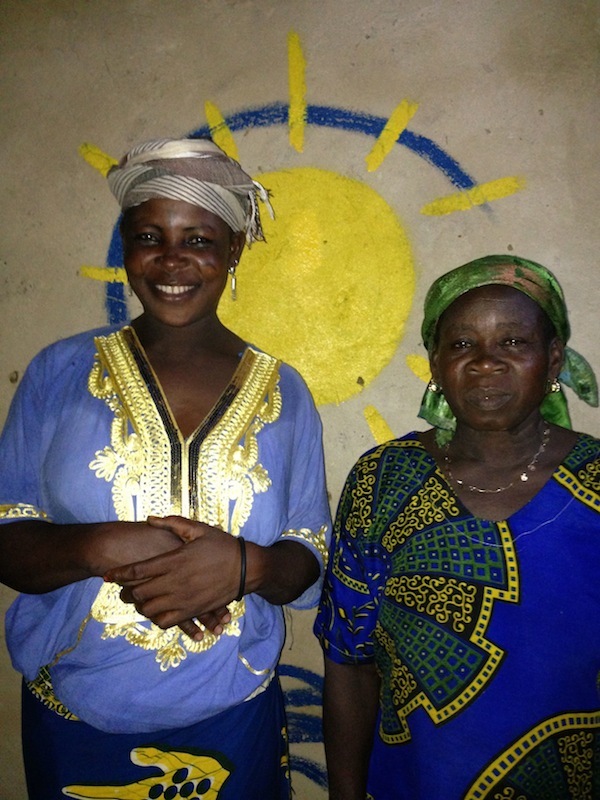 Abiba hands back a fully charged cell phone to Fahina, one of her female customers! Men own the majority of cell phones in Wambong, which makes them Abiba and Salima’s biggest customers. Most households report during monitoring that the phones in the house are owned and used by men. 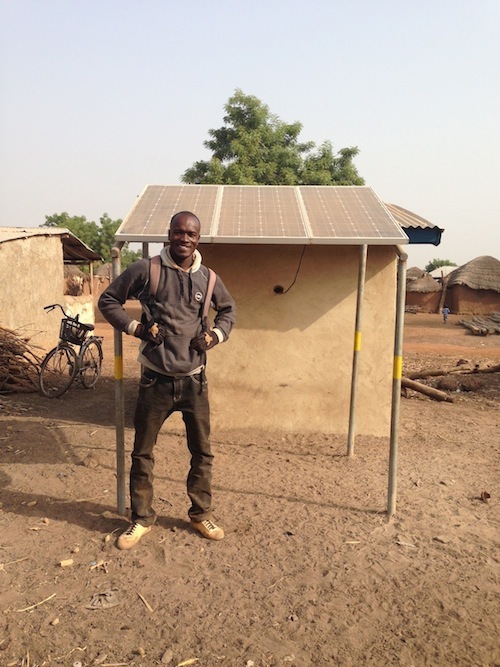 CWS field staff usually sees men at the solar center picking up or dropping off phones. 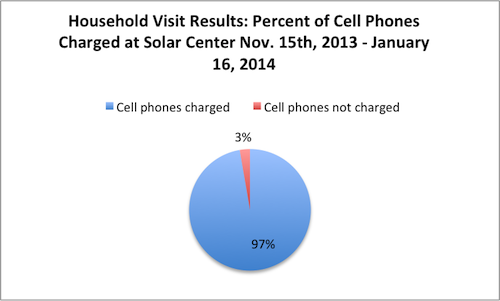 There are a few women who own their own cell phones but female participation at the solar center could be higher. 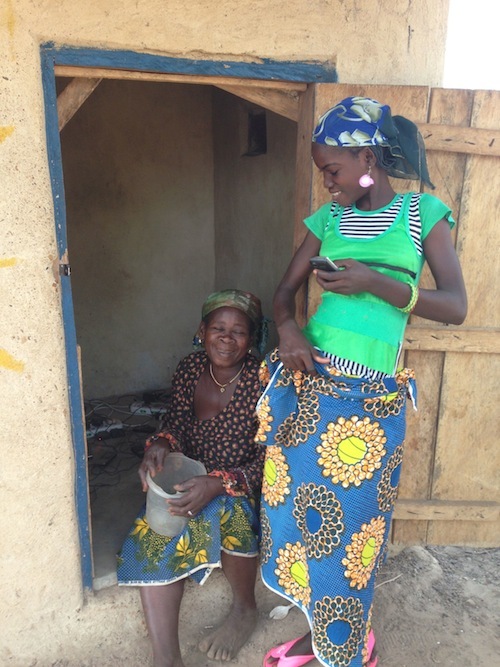 The CWS field staff is making women’s access to cell phone use a priority during household monitoring through survey questions and family dialogue.